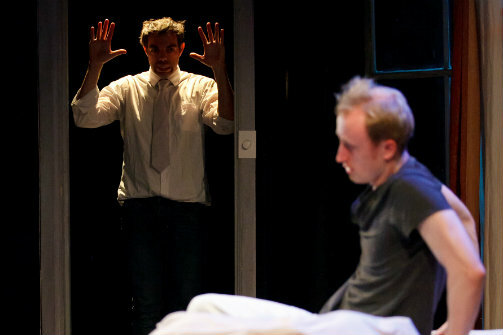 Brandon Walker and Logan Keeler in Rhinoceros. Photo by Justin Hoch. BOTTOM LINE: A necessary and timely play about the power of group mentality and the difficulty of remaining an individual. What if one day you wake up and your friends, family, and coworkers are turning into rhinoceroses before your very eyes? One day they’re “normal” citizens, and the next, they’re stomping rampant through the streets. How could something like this happen? Perhaps there has never been a better time for a parable about the fatal ends to conformity and group mentality than in today’s political climate. Originally written in 1959, Rhinoceros is a French absurdist play that pokes at the spreading of Nazi and Communist propaganda and ideology. Considering how politically polarized we have become, both in the U.S. and around the world, Rhinoceros could have been written today, and continues to speak volumes as it asks: how do we remain individuals against group mentality? Berenger (played by director Brandon Walker), an unkempt borderline alcoholic, is the opposite of the model citizen, especially compared to the suave Jean (Logan Keller) who radiates professionalism and prioritizes cultural outings that expand his mind and make him a more desirable bachelor. Jean does this not because he wants to, but rather because it’s what a “good citizen” does. As Jean tries to tidy Berenger’s messy hair and inside-out shirt, a rhinoceros shockingly hurtles down the street, right outside of the café. The café patrons are naturally horrified with confusion and disbelief. Those who didn’t witness it with their own eyes can’t believe the headlines in the next day’s newspaper. One particularly smart and logical coworker of Berenger’s, Botard (the talented Carla Torgrimson), refuses to buy this absurd story because it’s just not logical—in fact, it's impossible, since rhinoceroses don’t even live in their country. And yet, more and more keep popping up with each passing day. The people in Berenger’s life, including his new girlfriend Daisy (Autumn Mirassou), begin to shift their attitudes as the rhinos grow in numbers; instead of threatening, they are perceived as beautiful and peaceful. To his utter astonishment, his friends are actually opting to become rhinos, leaving their stressful lives behind. The physicality required of the actors in this play and the necessity of a cohesive ensemble certainly aligns with the ensemble-driven and actor-centric mission of The Seeing Place Theater. Rhinoceros is a true group effort with most of the actors on stage for the entire show, a choice that directly speaks to Ionesco's commentary about conformity and societal pressures. On the other hand, there are moments when the ensemble's excessive movement distracts from important scenes and dialogue between the main characters. As I witnessed the events unfold, I shared Berenger’s perspective in wondering, has the world gone mad? But the end of this production is a bit confusing as who the “mad” one really is—the rhinos or Berenger? As director, Walker crafts a bold final image incorporating protest signs that I interpret as mocking liberal beliefs and activism. Yet because this choice doesn't seem to be connected to his direction of previous scenes, Walker's intention remains unclear. While an unresolved conclusion can certainly be enjoyable and even satisfying, this one left me uncomfortable. Was the jab at liberals, conservative—or both? Rhinoceros is written by Eugene Ionesco, adapted by Derek Prouse, and directed by Brandon Walker. Production Design is by Erin Cronican and Brandon Walker. Lighting Design is by Duane Pagano. Stage Manager is Ari Veach. The cast is Brandon Walker, Joshua George, Rob Hatzenbeller, Logan Keeler, Autumn Mirassou, Emily Newhouse, Lisa-Marie Newton, Carla Torgrimson.